We have literally lost count of the number of girlfriends Salman Khan has had. During the elaborate wedding of his little sister, Arpitha, Khan decided to introduce his new girlfriend to the family. Romanian beauty Lulia Vantur. Strike a bell? The hot legs made her debut in Bollywood with the film, O Teri starring Pulkit Samrat. 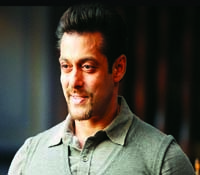 Khan first met Vantur in Dublin during the shoot of Ek Tha Tiger (2011). Interestingly, during that time, the Romanian lady was dating musician Marius Moga from whom Salman reportedly got the rights of the hit romantic song Teri Meri of Bodyguard. It was an adaptation from the Romanian song by Cleopatra Stratan. A close source to Khan said, a�?Salman and Lulia were always together. There have been rumours linking him to Jacqueline Fernandez and Daisy Shah, but the fact is that Salman is in love with Lulia. She is very comfortable with his family too.a�? The actor also introduced Vantur to his estranged girlfriend, Katrina Kaif. one would think we will get to see a lot more of this hit jodi, Sinha and Deva have decided to take a break. a�?So far, it has been so good for us. Whatever films we have done together, they have done well. We have had a great time but now it is the time to give each other a break. We have mutually agreed to that,a�? says Sinha. Meanwhile, the director said, a�?Well, when the character fits, why shouldna��t I go for her? She is very professional and doesna��t come with any tantrums. She is very good at everything she does, be it emotional scenes or dances.a�? One of the most anticipated films of the year, PK sees Aamir Khan, Anushka Sharma and Sushant Singh Rajput in it. But what you must know is that Khana��s son, Junaid, was roped in as an assistant director for the Raj Kumar Hirani film. Right from the beginning of the shoot at Rajasthan to Delhi and other parts, Junaid has been part of the process. In fact, on outdoor locations, Junaid didna��t take up accommo-dation with his father Aamir. He decided to mingle with other team members. Aamir took time off from the promotion of PK and made it for Arpitha Khana��s wedding. He surprised the audience, singing his popular Aati Kya Khandala and also tied a turban along with Salman. Earlier this week, Khan had a towering visitor a�� The Terminator aka Arnold Schwarzeneggar walked up to Khana��s room for a quick chat during an event in the capital recently. Whether a fan or if you dislike cricketer S Sreesanth, this news will definitely cause a reaction. Director and producer, Pooja Bhatt has signed the 31-year-old for her next film, Cabaret featuring Richa Chaddha. a�?I met Sreesanth a day before his birthday, earlier this month at his home. I knew that he would be able to play the role of a Malayali guy, who mentors a dancer. Initially, we had thought of casting someone who is older but when I saw him, I felt he is perfect,a�? she says, adding, a�?The character is very close to his persona. I have asked him to retain his Malayali accent. 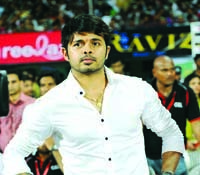 Sreesanth is a natural performer, he is camera friendly and I feel the film will do him good.a�? The movie will be directed by debutante Kaustav Narayan Niyogi, and will also star Gulshan Devaiah. The cricketer, after being banned for life by the BCCI for spotfixing, expanded his horizons in the entertainment sector. He had earlier shown his dancing skills in a reality TV show, Jhalak Dikhla Ja. 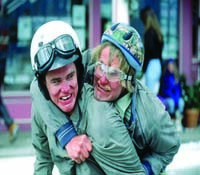 Twenty years after their earlier adventures, Lloyd (Carrey) and Harry (Daniels) reunite on a quest to find Harrya��s newly-discovered daughter (who was adopted), in the hope that she proves to be a match for the kidney he needs. Slapstick humour and gags abound, and while some are amusing most fall flat, making this sequel someA�thing of a letdown. gether storyline. Definitely worth a miss, we say.